Cards: Upper Deck College Legends 2011, Bowman NFL Europe Prospects 2000. Danny Wuerffel has had a colorful football career. The catalyst behind the 1996 Florida Gators National Championship, Wuerffel rewrote many of the school’s records en route to a Heisman Trophy and All-American Honors that year. He was drafted by the New Orleans Saints in the 3rd round of the 1997 draft, – where he received the ‘quarterback of the future’ label for much of his time there while Billy Joe Hobert and Billy Joe Tolliver handled being the quarterback of today. In 1999, injuries plagued the Saints quarterback rotation, but he only continued to see backup time, this time to Jake Delhomme. Afterwards Danny decided to hone his craft in Europe. Assigned to the Rhein Fire, Danny had an incredible season playing in the NFLE, culminating in a World Bowl victory and MVP honors. 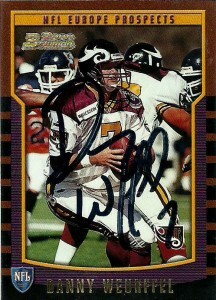 He returned stateside but did not see any playing time for the Packers and Bears in 2000 and 2001. Left exposed to the Texans expansion draft for the 2002 season, the Texans drafted Wuerffel, and then immediately traded him to Steve Spurrier in Washington. It would be the Texans first trade in franchise history, and for Wuerffel it would be a coming home of sorts- sort of- being reunited with his former head coach from Florida in Spurrier. With Wuerffel in place the Redskins could get Spurrier’s Fun ‘N Gun offense off the ground in DC. The problem with the Redskins was their pourous offensive line. Still Danny came in relief for the first 3 games before being named starter. He’d post a 2-2 record and throw his first 3 professional touchdowns in a 27-20 loss to the Dallas Cowboys on Thanksgiving day that year. The team remained surprsingly competitive even in their losses, but he’d head back to the bench for promising rookie Patrick Ramsey. After the season Danny retired, and has focused much of his time into charity and religion. His ministry, Desire Street, was doing well in its outreach program in New Orleans- before it was devastated by Hurricane Katrina. There was nothing left. He rebuilt it from scratch again and now services needy people in the Southeast, primarily in Mississippi, Louisiana, and Georgia. Wuerffel was also diagnosed with Guillian-Barre Syndrome, and has become an unlikely spokesperson for understanding the disease and the treatments available.